People forget too quickly that the railroad used to be the backbone of American commerce. Click here to play! In truth, it still is in many ways. In the early days of rail, railroad tycoons were ruthless entrepreneurs who had to face tough competition while rarely looking out for the little people whose land they needed to lay track across. It was a cutthroat era, but also a very lucrative one, where many great families made their fortunes. In the Jackpot Express slots, you can have a much more lighthearted time playing at being a railroad tycoon. Instead of laying down track, you'll need to lay down 3 of the same symbol along the paylines. 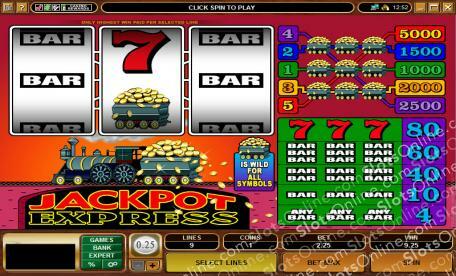 There are 5 paylines to play in the Jackpot Express slots, with 5 different jackpots to win. The highest jackpot is 5,000 coins for 3 Gold Train Car symbols on the fifth payline, so this is a very generous classic 3-reel slot machine. Have an adventure pretending you are a railroad tycoon of the Old West and make yourself a fortune on the Jackpot Express slots. The Gold Train Car symbol is wild in this game, and it can substitute for any other symbol.